Thanks to NVIDIA? CUDA computing technology, the video conversion processing enters a new era. Optimized by NVIDIA? CUDA computing technology, Pavtube CUDA Video Converters accelerates conversion to revolutionary fast. Converting video now is in minutes. Besides CUDA video converter adopts scaling technology which can export video with low resolution to high resolution, that is, standard definition to high definition. As the Best CUDA Converter, it can convert video or audio files with much faster speed without losing video or audio quality. As the best CUDA Video Conversion tool, it can use CUDA acceleration to fast and batch convert all kinds of videos files like AVCHD, MXF, TS, MTS, M2T, M2TS, SWF, AVI, MPEG, WMV, DivX, MP4, H.264/AVC, MKV, RM, MOV, XviD, 3GP, WTV, FLV etc at fast speed beyond your imagination. The CUDA based video converter presets optimized profiles for a great variety of digital devices including iPod, iPhone, BlackBerry, Apple TV, Zune, PSP, PS3, Pocket PC, Creative Zen, Xbox, Archos, Android phones, Windows Phones and so on. Moreover, the versatile GPU video conversion tool can adjust video effects like video cut, trim, crop, merge, clip, add subtitles, add video images, rotate video to correct degree and so on to meet all your different needs. Follow the step by step guide to know how to the video converter to utilize CUDA Acceleration convert video for playback at faster speed. Note: In order to use CUDA video converter, your graphics card must be produced by NVIDIA. The CUDA and AMD APP acceleration only work when creating H.264 encoded video files. How to Convert Video with CUDA GPU Acceleration? 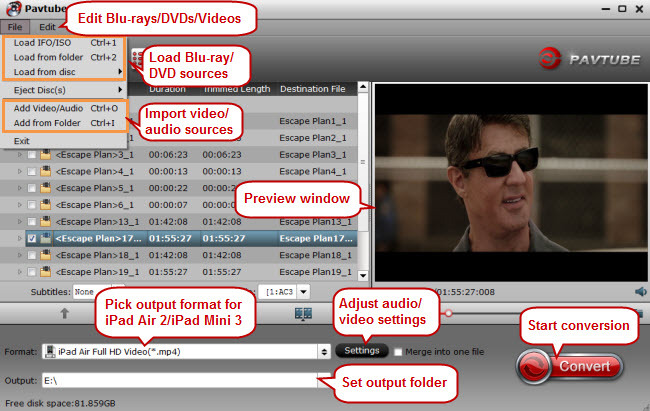 Click “Add Video” button to import the video or audio files which you like to convert with CUDA acceleration. From “Tools” menu bar, choose Options and launch Options window. 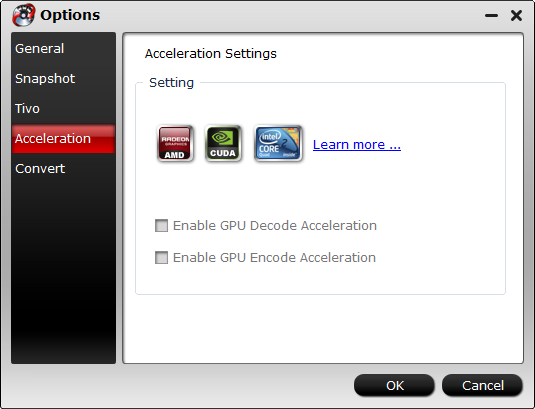 Under Acceleration tab, you can choose to enable GPU Decode or Encode Acceleration if your computer supports. Note that CUDA/AMD is accessible only when there is an NVIDIA/AMD graphics card that supports GPU en-decoding acceleration. The CUDA/AMD button will be grayed out/ denied when the software fails to detect a satisfactory NVIDIA/AMD graphics card. Click the “Format” drop-down button to select desired video or audio format as output profile. Step 4. Convert with CUDA GPU acceleration. Click “Convert” in the right side. The time of the conversion will appear in the convert up box. PS: The speed of the conversion has been affected by the Graphics Cards. The speed will change between 3-5X. If your Graphics Card is above 500, you conversion speed surely will reach 5X faster. More CUDA Video Converters are for you to choose like: BDMagic, DVDAid and ByteCopy. Related information: What is CUDA? CUDA is a parallel computing architecture developed by NVIDIA. With CUDA, your computer performance will increase dramatically by harnessing the power of the GPU. Also, we can say it is the computing engine in NVIDIA GPUs that is accessible to software developers through variants of industry standard programming languages.